Steel-Line Garage Doors offers a range of timber garage doors that can be matched to suit the look of your home. The most popular timber used in these models is Western Red Cedar, a lightweight yet solid timber that looks equally beautiful on an old or a new home. These products can be produced as tilt garage doors or sectional overhead garage doors, depending on your preferences and what best suits your home. We manufacture these doors on an aluminium frame to provide additional strength and durability. Each timber slat is hand-selected and individually fixed to the frame to create a garage door with both style and strength. As with our entire range, our timber garage doors can be automated. If you choose to include this feature, we recommend regular maintenance and annual oil treatments in order to keep your door running smoothly. As our timber garage doors are designed and manufactured on a case-by-case basis, you can rest assured we will create a product to meet your dimensions and requirements. No matter what shape or size your garage is, a timber door can be made to suit it – and it will look fantastic. 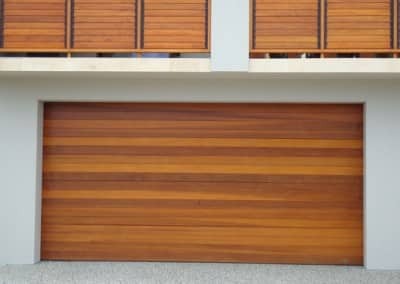 And because these models are custom-built, you can look forward to having a truly one-of-a-kind garage door that has its own unique look and character. Timber is one of the few natural, renewable building materials. With the right treatment, it’s also relatively easy to protect a timber garage door from other problems such as distortion, bending and rot. Wood is naturally a great sound barrier, which might make it an excellent option for properties on noisy or busy roads. While cutting down on sound, a door made from timber can also provide valuable insulation from temperatures on both ends of the spectrum, helping your home stay comfortable from summer to winter. As with all of Steel-Line’s products, our timber garage doors come with a guarantee of quality and durability. When you choose Steel-Line you can look forward to wonderful customer service, hassle-free installation, and a superb end result: a garage door you can rely on and be proud of. Call our friendly team on 1300 767 900 to learn more about our timber doors. If you love the look of timber, you might also be interested in our DecoWood® range or Biowood® range. No matter which model you decide on, you can click here to arrange a free measure and quote for your garage.